Gaolan Hou is Senior Lecturer in Development Economics in the School of Management and Economics, Beijing Institute of Technology. Before working with BIT, she gained a MBA in People’s University of China and a PhD in Chinese Academic of Social Science. More brilliantly, she is in charge of a Youth Project funded by Chinese Education Section. So far she has published almost 30 papers in domestic journals, such as Research on Productivity, Jianghuai Tribune, Contemporary Economic Research, Asia-pacific Economic Review etc, among them there are 6 papers are included by CSSCI (Chinese Social Science of Citation Index). Moreover, she published a monograph titled “Theory of Late-development and Strategy of Catching-up”. In addition, the second edition of Textbook “International Finance” edited by Gaolan has been published by Tsinghua Publishing House this year. 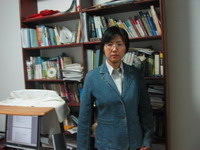 Currently, her research interest is focus on the sustainability of Chinese Economy Growth. From September 2009 to December 2009, she has been a visiting scholar at Bristol University and from January 2010 to July 2010, she will be working at Cambridge University as a visiting scholar. During the visiting period in the UK she hopes to explore the viewpoints on the Chinese economy through the eyes of western scholars and diagnose the problem of the Chinese economic development model, which has depended heavily on external demands, and to put forward possible solutions for it under the current global financial crisis in order to make China exert a greater role as an engine of world economic growth. She has taught several courses for undergraduate and postgraduate students including Macroeconomics, Microeconomics, Money and Banking, International Finance and Development Economics.